The partnership between the two companies has already resulted in a software development kit for industrial internet apps. 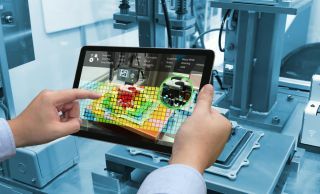 In order to help jump-start the industrial internet, Apple and General Electric have released new app-making tools to help connect power plants and other industrial equipment to the Internet using GE's Predix platform. Last week the two companies announced a partnership and this software development kit is likely the first of a number of upcoming collaborative projects. Now factory workers, service technicians and even pilots will be able to use Apple's familiar iPhones and iPads to access Predix's industrial internet capabilities. The Cupertino-based company has now carved out a place for itself by bringing support for its popular consumer devices to a number of industries that previous lacked it. GE will also benefit from access to over 13 million programmers who already have experience building iOS apps for the company's mobile platform. All of the new features baked into iOS 11 will also be available and even Apple's new augmented reality feature can be implemented into new industrial apps. Apple has already made a great deal of progress when it comes to the industrial internet and in addition to its partnership with GE, the company also has partnerships with Cisco, SAP, IBM, Deloitte and Accenture in the field.